On Wednesday, Josh Allen got some exciting news once the team had finalised that Lorenzo Alexander will be returning to the Bills locker room and joining them on the field for one last season. Naturally, Josh Allen took the news well and even told reporters that the Buffalo Bills team is now building something special. He also added that he sent Lorenzo a message on the day, congratulating him and also calling him captain. The 22-year old quarterback says Lorenzo is the captain of the team as he sees him as the leader, the person who they will look to for guidance on the field. Josh also said Lorenzo is more than just the team leader, thanks to his experience with the NFLPA that’s coming up this weekend. They also have many other applications coming up, which Lorenzo would a huge advantage for, getting the team off to a great start for 2019. Unsurprisingly, Lorenzo also expressed some excitement to return to the team, saying that the 6-10 end of last season shows that the team isn’t that far off and that they might just be able to get it together and make it to the playoffs in the next season. Josh Allen couldn’t agree more with Lorenzo and added that the Bills are certainly building something special at the moment. There’s no doubt that the positive light of these two players would have an effect on the rest of the team. Not only would they have more confidence, but they’ll have trust in the players who join them on the field. For now, Josh Allen is off to provide advice to Collegiate Bowl players who could be entering the NFL. He will be providing them with information about what to expect and what they’ll need to do to get the most out of their careers. Allen also told the media that he wants to tell them that when they get into NFL, they should expect themselves to be perfect. Instead, they should hop on the wave and take full advantage of the ride ahead. Sometimes it would be up, and other times it might be down. With that advice, we’re all looking to Josh Allen to see if his wave would be up or down for the season ahead. The QB played as a rookie last year in the Bills team and managed to amaze us with his throws, runs and simply incredible speed. Towards the end of 2018, some minor mistakes cost them a game or 2, but it’s not like they were aiming high with the new players in the team anyway. 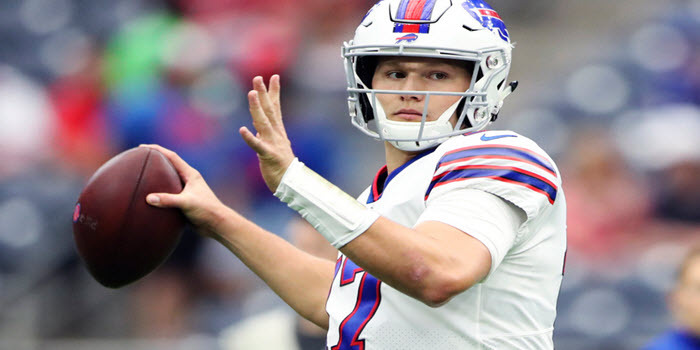 However, now that everyone has played part of a season at least, the team can aim forward, and Josh Allen can perform in ways we haven’t seen before, especially now with Lorenzo motivating him as well. Next Post:What Will the Massive Buffalo Bill Cap be Used for?